The first impression given by the opening track on this disc is of enormous energy and breadth. There is some superb singing from the assured and polished tenor Thomas Walker, while even more impressive is the remarkably full-bodied sound and glorious instrumental textures from the dozen players in Arcangelo. The booklet tells us that ‘Arcangelo aspires to be one of the world’s leading vocal and chamber music ensembles’; and on the strength of this recording, these chamber musicians are certainly well advanced along the path to realizing those aspirations. On top of that there is an extraordinarily vivid recording made in the wholesome acoustic of St Jude-on-the-Hill, Hampstead Garden Suburb. If there is just one small and minor disappointment, it comes not with the music, the performances or the recording but with a rather dull booklet in which texts and translations are squeezed up tightly against John Whenham’s informative note presented in three languages, a few grainy images, the usual recording information in microtype and the inevitable, unedited biographical puffs (with the tiredly predictable claim that X is ‘one of Britain’s finest young musicians’—if all Britain’s finest young musicians were laid end to end, it would stretch from London to Sydney and back). Only the sadly necessary admonition not to copy the material illegally gets both a typeface and space which can he read easily by the naked eye in ordinary daylight. Back to the music. Here we have Monteverdi at his most dramatic and colourful, with music from his sixth (songs of parting), seventh (songs with instrumental support) and eighth (introducing the genere concitato style) books of madrigals published in 1614, 1619 and 1638 respectively. That eighth book (described as ‘warlike and amorous’) contains two substantial ballets, one of which, Volgendo il del, opens the disc with such impact. A missing dance movement from Monteverdi’s original plan is added here in the guise of Merula’s Ciaccona. Another mighty work from the eighth book is the Combattimento di Tancredi e Clorinda. Written for performance at the Venice Carnival of 1624, Monteverdi claimed it re-created the agitated style described by Plato as ‘that harmony that would fittingly imitate the utterances of a brave man who is engaged in warfare’. It falls to James Gilchrist to be that brave man, and certainly his performance is one of amazing power and virtuosity; the lormer quality is vividly depicted as he tells ot the ‘horrifying clash of sword on steel’ (5'40"), the latter even more stunningly revealed in some alarmingly quick-fire articulation as he relates how ‘Outrage spurs them on to vengeful fury’ (6'10"). Also part of Arcangelo are six fine voices who create a moment of real emotional intensity at the start of the madrigal Or che 'l cielo e la terra e'il vento tace. 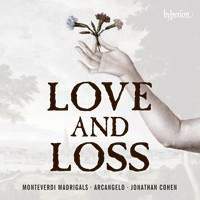 Here is the ‘loss’ of the disc’s title, potently conveyed with Monteverdi’s occasional sour harmonies and uncomfortable melodic relations adding an arresting piquancy to the sound. But where is the love? It appears, beautifully embraced by the two soprano voices (Katherine Watson and Anna Dennis) above the most delectable of plucked accompaniments in the madrigal Ohimè, dov’è il mio ben, dov'è il mio core?. All in all this is a wonderful disc, presenting Monteverdi the dramatist and the creator of vivid aural pictures. 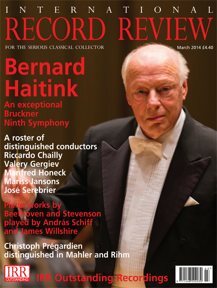 Presented in such vivid recorded sound and by such accomplished musicians, intuitively directed by the excellent Jonathan Cohen, it provides an invaluable and hugely attractive addition to the composer’s already generous representation on disc.